Buy Suburbia and PriceWatch, Buy this board game at the Lowest Price. In Suburbia you are the mayor of a small town, attempting to grow it through the acquisition of businesses, the building of community parks, and the development of residential areas. All of this is accomplished through tile purchase and placement. 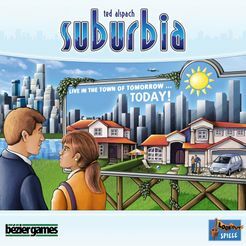 Suburbia plays from 1-4 players (there are special rules provided for solo play), and takes about 90 minutes to play. It ranks high all time on BGG and is the recipient of the "Mensa Select" award (this is awarded to games for originality, design, and challenge). The game is divided into 3 rounds labeled A,B, and C, with each round providing more expensive and complex tiles. Players are given a borough to place their purchased tiles and they will also track both their annual revenue and their popularity on their board. Your popularity drives up (or down) your population, and is added to your overall score every round. The player with the highest population at the end of the game, wins. Revenue gives you money each round and is how you buy tiles. To add a certain amount of increasing strategy to the game, randomly selected tiles providing a bonus for game play are displayed, one for each of the number of players in the game. Only one player will be able to get each bonus, so players are competing to complete as many as possible. If this was not enough each player is also given two secret goals, they choose one, and discard the other. The problem is that so many of the goals play against each other, one giving bonus for the most money while the other may give a bonus for the least amount of money. Each round players will choose one of 7 available tiles for the real estate market to add to their borough. These tiles include businesses that may increase your annual income, or community tiles that decrease your income but raise your popularity, and so on. The interesting twist to this is the first two tiles real estate market are face value, each tile there afterward has an added escalating cost added to the face value. When a tile is purchased each tile afterward is moved up and so decreasing its overall cost, and a new tile is added to the end of the market. So you have to wrestle with whether a tile is worth the added cost, knowing that as the value decreases the likelihood of it getting back to you is lower. The simplicity of the game is buy a tile/place a tile. The complexity of the game lies in the interaction of each tile to the other tiles. Almost every tile in the game has some sort of bonus or penalty to other tiles played in your borough. Whether it be due to the proximity (having a freeway next to a residential area, which makes you money but decreases your popularity), or merely by having a lot of businesses so to increase the income provided by your distribution center. All of this is the brilliance of the theme, so much thoughtfulness in every tile, how it interacts with the other tiles, and how it should give you a bonus or penalty. Picture ​ So I will warn you, there is a lot going on in this game. You may need to look at every tile on the table to give you a bonus, and then every tile placed thereafter. It is easy to miss a bonus or a penalty from your tile placement. This game is also not an easy one to explain. As simple as it seems (now that I know how to play), it just does not seem to register well with new players. There is so much interaction and immediate independent action that they seem to get a little lost. So this one might not be a good introduction to new gamers. But for those who love an excellent challenge and love to maximize every new play, based off your previous plays, this will be a favorite.